Following the attacks on the World Trade Center towers in New York City on September 11, 2001, Manhattan’s downtown Financial District was left in an utter ruin. Over the past 14 years, the city has worked to restore the area, replacing the lost towers with memorials and the new One World Trade Center, while also repairing the surrounding buildings that were damaged. EL Media customized the music and sound system for downtown Manhattan’s Le District, a French-themed restaurant and food marketplace across from the One World Trade Center. One such building was the former World Financial Center, located on the western bank of lower Manhattan, which was severely damaged by debris on 9/11. Now, the building is fully restored with office spaces, restaurants, and a high end shopping market, along with a new name for the complex: Brookfield Place. The recent opening of Le District, a restaurant, market, and specialty food shop is just one of Brookfield Place’s newest additions. This French-themed marketplace creates a unique experience where guests can dine at the full restaurant Beaubourg, sip wine and sample cheeses at Le Bar, or browse the market area for ingredients to cook at home. Each section of the complex has its own energy, which is why Le District brought in EL Media to help design the audio system and customize the music. The first zone of Le District is Le Bar and Beaubourg, which includes a sound system of Tannoy CMS801 loudspeakers with Community LV208 subs. The middle market area consists of Sound- Tube 600-series pendant speakers, while the outdoor seating area has Tannoy Di5 speakers with Community LV208 subs. The retail area has SoundTube 600-series speakers, and the entire set up is powered by Lab.gruppen C Series and ProAL 2400s. 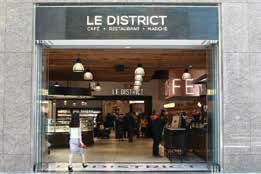 Le District’s specialty food marketplace is accompanied by custom music played through a system of SoundTube 600-series loudspeakers. For system processing, a Symetrix Radius AEC with SymNet 4 channel output cards keep the sound system at a low impedance of 8 ohms, but owners have the luxury to easily control the volume in each area. Over in the retail space, Lake said the music is much quieter, while in the main market area the sound is more prominent. When it comes to designing the audio for complexes like Le District, Lake said he likes to be involved from the beginning. Walking through Le District, you can hear the amount of thought EL Media put in to create the experience of each room. Passing between one section to another, the change in music is organic, like an invisible wall protecting the music in one room from bleeding into another, allowing each area to have its own experience. The entire project took about 16 months to complete, Lake said, with only small challenges along the way. Kelleigh Welch is managing editor of SCN. You can follow her on Twitter @kelleighwelch.